Do We Need To Vaccinate Our Pets Yearly? A yearly dog vaccination and health examination has been the norm for dog parents for as long as I can remember. Many people are now starting to question the need for this c5 vaccination. Do we really need to vaccinate our dogs yearly? Do senior dogs need vaccinating? What vaccinations do dogs need? Unfortunately, the answer isn’t quite so simple…it depends. Whether you give your dog an annual vaccination or change to every three years depends on the manufacturer of the vaccine and the disease you are vaccinating against. Read on for your step by step guide to puppy and dog vaccination including vaccination schedules, what vaccinations your dog needs, titre testing, diseases that vaccinations protect against and costs. The core vaccines are those vaccines that all dogs must receive to protect against infectious diseases of global significance. 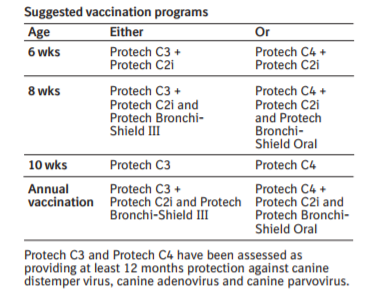 The three main diseases that these vaccines protect against are: canine distemper virus (CDV), canine adenovirus (CAV types 1 and 2) and canine parvovirus type 2 (CPV-2). Some countries will also include other diseases that must be included in the core vaccination schedule, eg. Rabies. Years of extensive research has determined that the vaccines that protect against the core diseases Parvovirus, Canine Hepatitis and Canine Distemper can produce antibodies for a prolonged time period. For that reason, many vets have moved from yearly vaccination to a three year protocol. The only vaccine brands that are suitable for vaccination every three years are Nobivac and Duramune. Other vaccine brands such Protech only offer yearly immunity. It is quite possible that this will change in the future as more companies do the research required to make these claims. It is also important to note that (aside from Rabies) killed vaccines do not provide long lasting immunity. For this reason it is very important that you have a veterinarian vaccinate your pet with a live vaccine. (Vets are the only ones allowed to handle live vaccines). Vaccines bought from an online store are always ‘killed’ vaccines. Likewise, those vaccinating who are non-vets, will be using a ‘killed’ vaccine. In those countries where it is law to vaccinate your dog against Rabies, it has been established that vaccination can be extended triennially, however you do need to do what the law says. Vets are currently lobbying some jurisdictions to extend Rabies vaccination from yearly to triennially. Protech C3 and C4 offers immunity for 12mths. Annual boosters are required. Boehringer Ingelheim product insert. Duramune C3, C4 provide immunity for 3 years after an initial booster course. Product insert from Boehringer Ingelheim. Nobivac DHP/DHPPi provides immunity against the core diseases for 3 years if you follow this protocol. Product insert from MSD Animal Health. Non-core vaccines are those that protect against diseases that might be prevalent in a particular geographical area, or where there is an increased lifestyle risk. When deciding whether to vaccinate with a non-core vaccine, you and your vet need to way up the potential risks of catching the disease versus the risk of having an adverse reaction to the vaccination versus being protected against the disease. The immunity inferred against these diseases is often short-lived, therefore annual vaccination is required. We need to remember that like humans, dogs are all different. Vaccination guidelines are designed to suit the majority of a population, that, of course, can mean that some dogs will have adequate immunity to vaccination, while others won’t. We can check the immunity status of our dogs against the core diseases by titre testing canine distemper virus (CDV), canine parvovirus (CPV), and canine adenovirus (CAV) antibody only. A small amount of blood is tested and the presence of antibodies against the disease tested is noted. Remember this does NOT test for cell mediated immunity. If antibodies are present: the dog doesn’t need vaccinating. If antibodies are absent: the dog may require vaccinating**. Some dogs are what we call “non-responders”. These dogs may never respond to a vaccination, or in the case of puppies, it might be that maternal antibodies were high and interfered with the development of antibodies. It makes perfect sense to titres test puppies who live in high risk areas 2 weeks after their 16 week final vaccination. This will pick up any pups that have failed to develop an immune response to the vaccine. These pups can then be revaccinated and cross fingers (titre test check) they will respond. You can read more about puppy vaccinations here. In the vaccine schedule inserts copied above you will note that these companies recommend a vaccination schedule that finishes at 10 weeks of age. Although these companies have undertaken rigorous research to get this claim, myself and many veterinarians feel uneasy with this protocol. Many cities have a major problem with Parvovirus and we need to remember it is one of those diseases that lasts a long time in the environment (up to 7 years or longer). The presence of maternal antibodies can prevent vaccination working effectively. In areas where parvovirus risk is high, it is recommended to have the last vaccine booster at 16 weeks so that we can be more certain that maternal antibodies won’t interfere with the development of immunity. To be absolutely sure that your pup is protected, titre test at 18 weeks of age. Every year our dogs need to be examined by a veterinarian. Your veterinarian will be checking them all over ensuring that they are healthy and well. Your vet will also discuss your dog’s behaviour and nutrition. 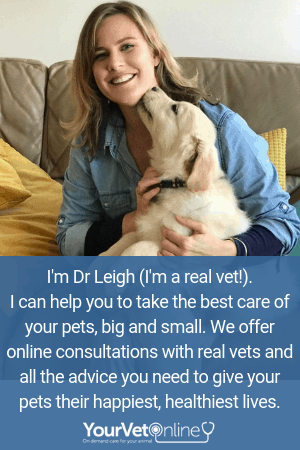 Vets are trying to pick up on any little sign that things might not be quite right, so that we can do the appropriate checks and ensure we keep your dog healthy. During this exam your vet will discuss parasite preventatives and advise on what core and non-core vaccinations are required. It is likely that your dog will require a vaccination yearly, it just may only be for one disease. Your vet might be concerned that something is not normal and recommend blood and urine testing. Your dog’s yearly health exam is so important. As they say, prevention is better than cure, and these exams allow us to pick up on health issues before they become big problems. ** A negative titre test may not mean your dog is unprotected. In a healthy dog that has been regularly vaccinated it may mean that there is adequate B lymphocyte (cell mediated immunity). However, there is absolutely no way to test for this at this point in time (2018). Therefore a booster vaccination is recommended. If your dog is immunocompromised by a disease, has had a reaction to a vaccination in the past, is being treated with immunosuppressive drugs or has a history of immune-mediated disease (eg IMHA), your vet may recommend not to booster. To help you have a great experience with your vet, we have developed this gift for you: a free downloadable checklist to help you prepare for your pet’s veterinary exam. Be sure to share this article with your dog owning friends. If you have a question you would like answered leave it below and we will get right back to you! Often wondered about this, thanks for the advice. This is great advice. I need to know that! So glad it was helpful to you Fancy.